“A mirror and a pink powder puff, a hairbrush and comb, a jewel-case and a perfume. All in a row on a nineteenth century dresser. Nostalgic objects of desire. To apply face powder or lipstick and comb one’s hair at leisure. To put on a necklace and gaze into a mirror. Maternal emulation. Family remembrances and joys inherited from a genteel past. Personal items made with precious materials. 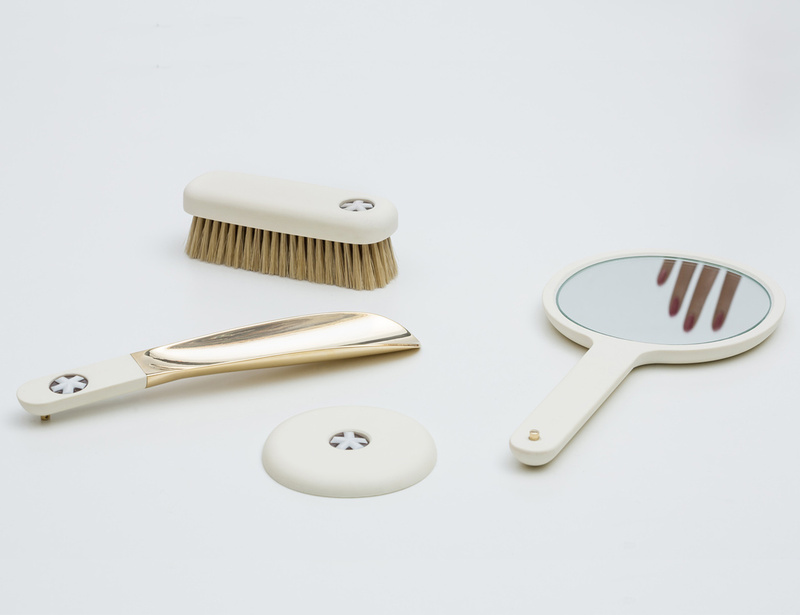 Shoehorn, brush and hand or compact mirrors. In the Toilette set the star-role cameo may portray perhaps a pro le, an ini- tial,a detail of the body.A symbol with a secret,a story to tell. Encased in Avoriolina, each article and its components are fashioned by expert Italian hands. To create these sweet reminiscences, these things of beauty”.